Three weeks and counting to the release of the second Mermen of Ea Series book, Into the Wind, from Dreamspinner Press! May 5th all ya’ll! I’m waiting on final cover art, so no preorder link is available yet, but you can read more about Into the Wind here. In the lead up to release day, I’m running a pre-release, pre-blog tour giveaway here on my blog. only for this one, please. I promise I’ll have some goodies for non-US readers in upcoming giveaways, though. winner on May 4th from all the entries here. Into the Wind is the direct sequel to Stealing the Wind, and takes up the story of Ian Dunaidh and Taren Laxley, shape-shifting mermen (Ea). There are a few surprises in this book I hope you’ll enjoy, and the book starts off with a bang (literally), as the Phantom is attacked on her way to the Gateway Islands, where the crew hoped to locate the cruel pirate, Odhrán. DEAFENING CANNON fire rang out from the port side of the ship. Ian braced himself against the stair railing to keep from falling backward as the ship leaned deep and heeled hard to starboard. He heaved himself upward and crested the stairwell to the deck as the ship pitched again, forcing him to grab one of the barrels lashed to the deck to remain upright. Cannon shot landed off the bow, sending water over the forecastle and cascading down the already sodden deck. The acrid smell of gunpowder stung his nostrils and burned his eyes, and the familiar scent caused his adrenaline to skyrocket and set his mind racing. “She’s fired on us with no warning shot, Captain!” Renda, the ship’s quartermaster, barely looked at him as he struggled to steer the Phantom out of the line of fire. “What colors does she fly?” Ian shouted as he ran toward the helm and lifted a spyglass to one eye. “None, Captain! Her crew’s human! Navy ship!” Renda shouted above the cannon fire. Ian felt it too. There were no Ea aboard the attacking ship. An entirely human crew? Only the Derryth navy sailed brigantines. But if he and the crew of the Phantom were fair game for the king and his navy, why didn’t they fly Derryth’s colors? They’d appeared out of nowhere. Had the mist been so thick that the men on watch had missed her? Renda ceded the helm before Ian could think much more about it. For now, he needed to focus on their attackers and on gaining the upper hand. It had been more than twenty years since Ian had taken his ship into battle, but his crew was well seasoned. He prayed silently to his goddess that the winds would favor them. “Derryth?” he asked Renda as he steered to avoid another blast from the enemy’s cannons. “Aligned with the Council? Or is this just a coincidence?” He’d expected to face the island Ea in battle eventually, but never had he expected them to use humans to chase them down. Humans did not possess magic. When had the island Ea recruited the humans to their cause? The thought made Ian’s blood boil. Humans had nearly wiped out their kind hundreds of years before, looking for the fabled rune stone, a weapon more powerful than the Derryth Kingdom’s largest cannons. Had someone told the humans they were heading to the Gateway Islands to find the reclusive pirate, Odhrán, and recover the very weapon that had nearly been the cause of their destruction? No. He mustn’t think about that now. He needed his wits about him to keep his ship safe. Then he could think more about the implications. He focused once again on the ship and her crew. The feel of the wood beneath his hands and the stiff wind against his cheek always warmed Ian’s soul, even in the midst of battle. The bright, crisp scent of the salt spray awakened his senses and mind. He’d been born for this command, although he’d paid a stiff price for it. His father before him had been a sailor, although he’d long given up the seafaring life by the time Ian had learned to sail in the Derryth navy. Sailing was in his bones and his blood. The only thing he loved more than sailing on the water was swimming in it. Stealing our wind! Ian cursed beneath his breath. With the enemy positioned between them and the wind, the Phantom could do little to maneuver. If he hadn’t been forced to stay within the Council’s reach, tied to the island, he’d have long before found the best clockmaker in Derryth and purchased a sextant. He was tired of others sighting guns upon the Phantom so easily. Their ancient astrolabe might have sufficed twenty years ago, during the civil war that cleaved his people in two, but it was useless against a better-equipped navy. As things stood, Ian could only guess at the angle of the enemy’s guns and what direction he might be able to steer the Phantom to avoid them. He glanced skyward and was momentarily blinded by the sun’s brilliant reflection in the lookout’s spyglass. He moved his gaze to the mainsail and the seagulls that rode thermals alongside it. It had been a calm day until the enemy appeared. Now the wind raced the heavens. The telltales on the sails fluttered frantically with each powerful gust of the wind, making it difficult for Ian to determine the wind’s direction. He fought the helm in an effort to maintain their course as the sea swelled and the ship bucked. Worse yet, the Phantom was poorly situated in the wind on a close reach that placed the ship at a crucial disadvantage. The enemy’s guns belched again and cannonballs spun past, spitting fiery tar and narrowly missing the main mast. The flames that licked from the metal nearly set the mainsail afire. “They’re using pitch!” Renda shouted as the pungent smell of burning pine reached Ian’s nostrils. Ian heard his father’s words echo in his mind. “There is nothing as deadly as fire at sea.” If one of those cannon blasts hit the Phantom, she’d go up in flames. Heeling starboard as the Phantom was, her portside guns aimed high above the waterline. Each cannon shot fired was nothing more than wasted ammunition. They were outmanned, outgunned, and out-positioned in the wind. Damn. Ian considered his options quickly, mulling their position relative to the enemy and eyeing the wind in the sails. He had no choice but to bring the ship about and take aim with the starboard cannons. Yet if he turned and lost the wind, they’d end up in irons and stalled in the water. “Are the starboard gun ports open?” Ian shouted. Another blast from the enemy ship’s cannons landed within a yard of the Phantom. The ship shook with the impact, and several crewmembers scrambled to better tie down some of the supplies on deck. A quick glance around the deck told Ian that his beloved Taren was not there. He reached out first with his innate senses and was relieved to feel Taren’s strong heartbeat as if it beat within his own chest. Their connection had continued to grow stronger over the past few months. Among Ea, a bond like theirs—what their people called soulbound—was rare. Where most Ea could only sense that one of their brethren was near, Ian and Taren could sense each other’s presence in particular. Sometimes Taren’s fear became Ian’s, and although Taren had not spoken of it, Ian guessed his own anger and frustration sometimes became Taren’s. Ian looked up, searching the mastheads and rigging with his eyes, and found Taren atop the main mast. He worked furiously, tying Turk’s heads in the rigging as fast as he could and adjusting the sails to compensate for the heeling Phantom. “Aye, sir!” Renda barked commands and the boatswains flew into action with whistles and hand signals. When Ian saw that Taren had acknowledged his orders, he brought the Phantom hard about. She bucked the squall and swell as Ian fought the wheel to turn her, and she listed her worst yet, her masts lying but thirty degrees off the water. At midturn, a volley of cannon fire caught the Phantom’s bow, causing her to shudder angrily as wood splintered and flew, mortally wounding one of the crew in the chest. Bright red blood splashed the deck to mingle with salt water and run past the smoldering pitch. Crian! Renda ran to help the injured sailor. Perhaps he could help the man long enough that he might transform and heal his wounds. But Renda’s slight shake of his head and icy expression told Ian there was nothing to be done. Crian was dead. Ian’s gut clenched when he thought of Crian’s family. Why was he so surprised that he’d lost a man? Had he really believed this voyage would be anything but risky? He’d naively hoped their mission would be a simple one: find Odhrán, retrieve the rune stone, and return it to Vurin, the leader of Ea’s mainland colony, so he might better protect their people. He searched the rigging for Taren again and couldn’t find him. He’d felt Taren’s steady presence only moments ago, but he’d been too preoccupied with the battle to keep track of him. At least he could still feel the steady beat of Taren’s heart. He finally spotted Taren aft, now atop the mizzenmast, clinging to guy ropes and swinging wildly with each turn of the helm. 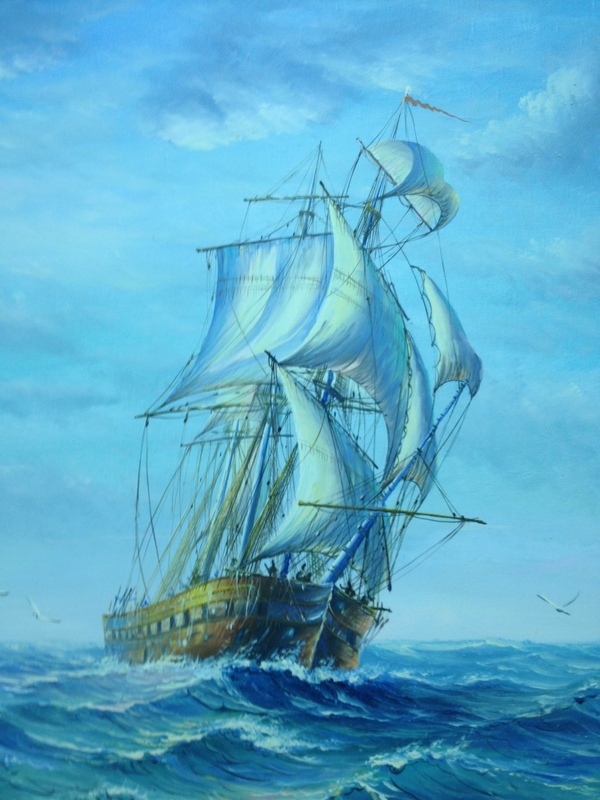 Taren had left their cabin at dawn to work on the sails with the intention of increasing the ship’s speed. He loved to toil on the rigging, and Ian knew how his spirits soared with the feel of the wind on his face. Taren’s acrobatics never ceased to amaze Ian, but they nonetheless left him cold with fear. Taren was nothing short of a long-tailed monkey in the rigging. Ian’s shouts went unheeded—Taren couldn’t hear him over the chaos of the battle. Ian only hoped Taren had guessed what his next maneuver might be, and had good purchase on the ropes to keep him from falling. The navy ship tacked in tandem with the Phantom and now aimed its sights at her stern. Ian couldn’t risk a blow to the most vulnerable part of the ship and had no choice but to adjust course again to avoid a hit. He spun the wheel the hardest yet to starboard. The ship protested the quick maneuver, her teak wood groaning and creaking under the strain as she stalled in irons. In his quick decision to turn hard, he’d been reckless. They were headed directly into the wind now and were dead in the water. Ian looked up and found Taren as he kicked out like lightning and baffled the aft sail to back the ship. An eerie silence descended, and they waited to see if the Phantom would catch her wind speed. Not a whisper of wind touched the sail. Taren reached for the rigging and swung out hard, kicking angrily at the sail once again. The sail billowed once, twice, and Ian’s breath stuttered, his warning shout lodged in his throat. He knew precisely what the aft sail would do. With a whoosh and an earsplitting snap, she filled and the Phantom regained her air once again, leaping to top speed. Ian watched in admiration as Taren swung down on the ropes just in time to avoid the snap of the sail. He landed gracefully on the deck a dozen feet away. “Ian!” Taren shouted as he ran over to the wheel. Another shot from their attackers landed close to the Phantom, causing Taren to grab a hold of one of the nearby rails. “Why don’t you send a few men down?” Taren panted hard, clearly winded. Ian sensed his excitement and his fear. No. Sensing wasn’t quite right. Ian felt Taren’s emotions as if they were his own. But Taren was already halfway toward the bow before Ian could finish. “No! Taren! You don’t understand! You can’t just—” Ian had no one to blame but himself for Taren’s lack of knowledge of Ea battle tactics. He glanced around, hoping to find someone to take the wheel. He needed to stop Taren before he did something dangerous, but before he could call out to Barra, the Phantom’s guns fired and missed. The navy ship returned fire, and a loud crack sounded from overhead as the shot hit the mizzenmast and the aft sail caught fire. The mast shattered, sending beam and splinter out at light speed. The sound of the mast breaking into smithereens was the last thing Ian remembered before his world grayed, then faded to black. TAREN TRANSFORMED as he entered the warm tropical water with a splash. He’d grabbed an ax as he’d run, ignoring Ian’s shouts. He didn’t need Ian to lecture him about the danger of attacking the brigantine from below. But if this worked…. He’d barely caught his breath when he had to dive deep to avoid a deadly blow to the head from the enemy ship’s keel as she passed over him. Pumping his powerful tail, he swam after the Phantom’s challenger. He knew Ian would be angry with him for taking such a risk—he could almost feel that anger burn hot within his own heart. He’d face Ian’s wrath later. Had the Ea become so complacent in their human forms that they’d forgotten what they were? The enemy brigantine was sleek and faster than the Phantom. They’d been nearing the Gateways, the chain of islands just west of Ea’nu, looking for Odhrán, the pirate rumored to possess the rune stone, when they’d been set upon. Taren surmised the brigantine’s captain knew the Phantom would be in the vicinity, and had waited in the mist until she could gain the weather beam over them. Strange. Stranger yet, he’d sensed that the ship held humans when it passed over him. Why would humans pursue them? Had they learned of the existence of merfolk, or did they believe them to be pirates? No. It’s more than that. This all felt so familiar, as if he’d dreamed it. Expected it. Sensed something he hadn’t understood until just now. Several more cannon blasts narrowly missed the Phantom and landed in the water nearby, bringing Taren back to himself. He fought the rising swells and powerful current as the wind picked up speed, echoing his own growing apprehension and worry for Ian and the Phantom’s crew. He dove, pumping and flexing the powerful flukes of his tail to propel him toward the enemy ship. He reached her rudder a minute later. As fast as she was, he fought to keep up with her as he swung the ax at the place where the pintles and gudgeons met to hold the rudder in place. He’d expected resistance when the axe struck the metal of the hinges. He didn’t expect the force that threw him backward and knocked the ax from his hand. Magic? Vurin had taught him to sense it, but he’d been too distracted by his work on the sails to feel it before. But how would a human ship use magic? What a fool he’d been to assume Ian and the other Ea wouldn’t have sensed it as well. Taren heard another explosion right before it reverberated through the sea, and he watched beneath the water as the Phantom’s keel turned sharply and she suddenly lost speed. Even with her crew’s skill, without the wind, the Phantom would have no chance of outrunning the enemy. Would Ian surrender to the humans? Could he? If the humans knew what they were…. Of course they know! They’re using magic. He needed to get back to the ship. Help them fight the humans. On the ropes, he could do something. Here in the water, he was helpless. He broke the surface of the water and glided easily over a swell using his tail to keep his head above the waves. He couldn’t remain above the surface long. His Ea lungs protested the air, created as they were to breathe oxygen through water. But he needed to see the plight of the Phantom for himself. He watched as half a dozen men climbed the brigantine’s masts. They were readying to raft alongside the Phantom and board her. In a minute, perhaps two, they’d swing from the masts and land on the Phantom’s deck. Taren’s heart grew cold with fear, and the air whipped around him as he prayed the wind would change direction. If the Phantom could gain even a modicum of speed, her crew might outmaneuver the humans. The reverberation of multiple volleys of cannon fire radiated through the water and sent fear through Taren. The first missed its mark, but the second shattered the mizzenmast. Pain seared Taren’s heart and he knew Ian had been hit. Panic shot up his spine as he felt Ian lose consciousness. No! Goddess, no! Please, you can’t take him! Not when I’ve just found him again! Taren prayed once more that the winds would shift. If the Phantom could gain some speed, he had faith their ship could outmaneuver the humans even with the damage to the mizzen—Barra, their navigator, knew these waters well, knew the reefs well enough to navigate between them, whereas the humans might not. If he isn’t too badly hurt. The surface of the water rippled, although this time it was not on account of the battling ships. The wind. Had the goddess heard his prayer? He closed his eyes and imagined the goddess’s hand coaxing the wind to shift to favor Ian and his crew. He felt the wind stroke his cheeks, felt its fingers stir the water. Imagined the Phantom’s sails filling and the feel of the helm as it pulled against the rudder. Taren felt the zing of magic caress his skin—a familiar sensation he tried to place—but his attention was drawn upward by the sound of an explosion. He looked up in time to see something dark speed toward him: another volley of cannon fire. He flexed his tail and swam down. The cannonball missed him by inches. As he sank beneath the water with a heavy heart, a flash of movement filled his peripheral vision, the outline of a tail. Before he could turn to get a better look, something hit him hard in the back of the head. He valiantly fought the urge to surrender to the darkness, but his eyes fluttered closed. Rest now, a voice in his mind commanded, and he knew no more. IAN LAY flat on his back, looking up at the mizzenmast—what was left of it. The mast itself was cleaved in two, the upper topsail was missing, and the lower hung from the ropes over the mizzen sail. With the help of a strong arm, he pulled himself up to a sitting position. “And what would you have me do about it?” Ian stood, swayed, then steadied himself on Renda’s shoulder. Ian ignored Renda and stumbled back to the wheel. He’d expected to see Barra there, since he’d been shouting commands to the other men while Ian steered, but instead saw Keral, one of the other hands. At least he’d the sense to take over the helm while Renda fussed over Ian like a mother hen. The ship bucked and shuddered as Keral turned sharply to avoid another cannon blast. Ian gritted his teeth and grabbed Renda’s arm, thankful that he was nearby. They were out of options. Even with the mizzen sails intact, they’d been outpaced by the smaller ship. With the mizzenmast destroyed, they would be far slower and the Phantom would be more difficult to steer. Ian was just about to tell Keral to give the order for all but his officers to abandon ship when a gust of air brushed his cheek. For a split second, he sensed something familiar about the wind, as if it had stirred a memory buried deep in his soul. Then the feeling fled and he realized the wind had shifted to the northeast. A moment later, he felt the Phantom’s remaining sails catch the wind. The ship began to pick up speed, moving away from the enemy ship, which had slowed so its crew might board. Keral spun the wheel and the ship heeled dangerously close to the waves. “Fire!” Ian shouted to the men manning the guns. Ian dropped to his knees and clutched his head as his heart beat so hard against his ribs that it hurt. Goddess! Taren! “Let me help you.” There was none of the usual chiding in Renda’s voice as he gently pulled Ian’s hand from his left temple. Ian felt the warmth of Renda’s healing against his skull. With the touch, Ian’s pain abated. “Taren,” he moaned when he came back to himself. He reached out with his mind and felt the beat of Taren’s heart. Slower than before, but steady. Knocked out, perhaps, by the last volley? “You felt his pain?” Renda asked, clearly surprised. Ian nodded. “He’s alive. But he’s unconscious. Injured. I must find—” “A hit, sir!” one of the men shouted over the howling wind. With Renda’s help, Ian got back to his feet. He saw it now—the smoking wound in the enemy ship’s stern. She floundered, her rudder damaged and no longer able to control her course. Even if she used her sails to steer, the Phantom would be long gone. Ian murmured a prayer of thanksgiving to the goddess. Now, if he could find Taren, he’d rest easy. What I like about the ocean is how big it is and that I can feel like I can lose control and not have to worry about everything becasuse it will be there no matter what i do. What I love about the ocean is the way the waves feel alive and vary with the weather. The ocean is beautiful on a sunny day, but awesome on a stormy day. It’s been so long since I’ve been to the ocean… but I remember loving to just float in it, bobbing in the waves. So relaxing! I love the feel of the sand and water between my toes. I now watch for me a merman. They have always been my favorite mythical creature. I love this series and all that it has explored. I cant wait for more. Looking forward to this 2nd story of the series! What all has been in it , the lovers , marriages , deaths. It’s peacefulness is perfect . The past mystifies me ! I think of the ocean as love, life, beginnings and ends . Just the thought of floating or swimming so free in buoyant waters (waters that subtly change colors on a near-constant basis), and seeing the many different species that live in the ocean in in harmony without all the strife of political or religious or power-hungry individuals trying to control everything is like a fantasy that I would love to experience. Thank you for the giveaway opportunity! I’m excited for the sequel! I love the ocean and miss living near it. I loved playing in the water and trying to jump the waves. If I didn’t make it, I’d be washed to shore. It was like being in my own world. Sometimes it would be so peaceful under the water and sometimes not so much. I love how small the ocean makes me feel. I grew up landlocked, hundreds of miles from the nearest ocean in every direction, and have only recently moved to live near it. You feel so important on land – so big and in charge from day to day, but the minute you lose sight of shore and take in the salty air and the expanse of swirling beauty and light, you realize that you are just a drop – but a unique and beautiful one. Its terrifying, its peace bringing, I regret that I didn’t grow up knowing it. Can’t wait for Into the Wind!!!! The ocean always reminds me of my mom’s parents house. It was this beautiful color that I always thought was the color of the ocean right before a storm. Now every time I’m at the ocean I remember the fun times in that house when I was little. I have read the description and know that I’m not allowed to participate in the contest, because I’m not living in the US, but I have to leave a comment nonetheless. I hope you don’t mind. 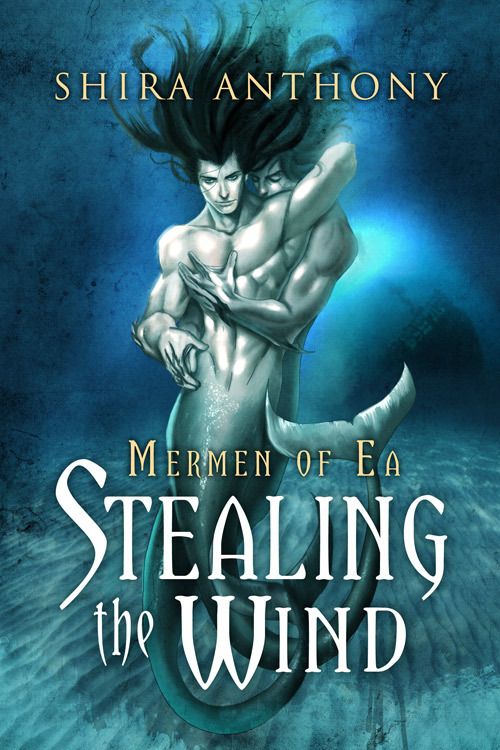 I found out about the “Merman of Ea” series by coincidence and immediately felt in love with it. I feel like home when I’m sitting on the beach and I could listen to the sound of the waves for a half eternity. The ocean represents freedom and comfort for me. I love it since I’m a child. I could barely walk and insisted of being able to swim. Of course I was not able to swim so I sank down like a rock before my mum pulled me out, but I never feared the ocean, my love only grew. One day I wish to live next to the ocean. For now I enjoy the book. I bought the first volume and when it arrived yesterday I started reading it. It includes everything I could wish for. Merman, the endless ocean, romance and an exciting story written in a wonderful writing style. I’m looking forward to the second volume “Into the Wind”. Thank you so much, Svenja! I’m so glad you’re enjoying the book. I promise we’ll have some contests for foreign readers coming soon! I have spent so much time living close to the ocean, Virginia Beach to San Diego. The ocean is so soothing and relaxing. When the waves come in, they grab onto your problems and wash them out to the sea with the outgoing tide. I can go sit and watch the water and just let my troubles wash away. I am a ppl watcher and I love to go sit and watch all the families running and playing, the kids running and jumping in the waves. I no longer live by the ocean and I really miss it. Maybe I need to start reading books that take place around waters. I finally got the Mermen of Ea so I have to read it befor the new one comes out! I’ve been doodling mermen so I’ll share them soon!